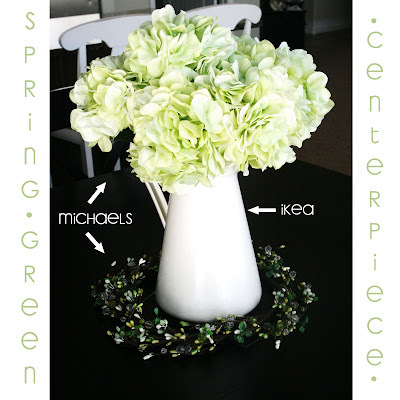 I put this cheery green centerpiece together the other day. I'm in LOVE with this great creamy/distressed tin pitcher with handle, that I found at the big blue store. Today is such a beautiful day. Spring is definitely in the air. Can you feel it!? yay! I saw the beaded wreath today. I went to buy it and thought what will I do with it...set it back down. UGH! I might have to run back tomorrow to see if I can get it. Love the arrangement! Love the arrangement, So fresh & springy! ha, i have that same pitcher! love it! oh yes, to answer your question, da font. Love it. I am going to have to make it to an Ikea sometime! It sounds like it is amazing. I love green and I love Hydrageas ... Can I have that? ta.